The house is set back from the single track road that loops through Borve off the A87 Portree-Uig road, and is situated just three miles from Skye's picturesque capital, Portree. This central location is ideal for touring the island. The cottage has been awarded three stars by VisitScotland and provides real home from home comforts for up to 4 adults plus a child. There is a comfortable lounge with colour tv and dvd player, a spacious dining kitchen with all facilites including electric cooker, washing machine, microwave etc, and a ground floor shower room with toilet and wc. The cottage also has a freezer and a tumble dryer. Upstairs there are three bedrooms, one double, one twin and one small bedroom suitable for a child or smaller adult. 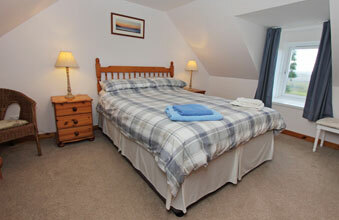 All electricity including heating is included in the tariff, and bed linen and towels are provided. Free wifi internet is available in the cottage. The cottage is no smoking. One small pet may be taken by prior arrangement.